The lack of enough instruments to record earthquakes in and around Oahu has been identified as the main cause of why there was an incorrect report of an earthquake in waters off Kohala on the Big Island, a federal official said. The epicenter of the earthquake, which was felt throughout Oahu, was actually between Molokai and Oahu. Initially, the U.S. Geological Survey Web site reported a 3.2-magnitude earthquake off Kohala at about 8:10 p.m. Monday. The Web site later changed that to report two nearly simultaneous quakes, the one off Kohala and another, of 3.7 magnitude, between Oahu and Molokai. Finally, yesterday morning, the site was updated again to remove any information about the Kohala quake. 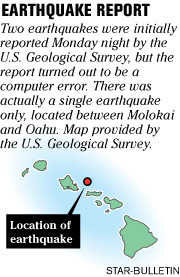 After reviewing the computer-generated analysis, officials with the U.S. Geological Survey revised the report to reflect one earthquake between Molokai and Oahu. Hawaiian Volcano Observatory seismologist Paul Okubo said the computer mistake was "unusual." "Our automatic systems did not really perform," he said. "Our systems are not looking at an adequate number of data channels from other parts of the state for us to reasonably expect to nail every earthquake from every part of the state." Okubo said the reason for the error stemmed from a system designed to record earthquakes in and around the Big Island, where there are active volcanoes. He said there aren't as many instruments recording earthquakes in the vicinity of Oahu and the further away an earthquake is from the Big Island, the harder it is to identify the location. Okubo said with the expansion of the tsunami warning system in Hawaii, more earthquake-recording instruments will be installed on Oahu and officials expect the reporting accuracy of earthquakes to improve. The 3.7-magnitude earthquake, which was centered 27 miles east of Kailua, was felt throughout Oahu and west Molokai. USGS officials said Windward Oahu was among the areas that felt the strongest jolt, with more than 250 calls received from Kailua residents and about 200 from Kaneohe residents. The earthquake was felt as far as 88 miles away in Waialua and rose to level IV intensity -- light with no damage -- in Kahuku, Kaaawa, Kailua, Kaneohe, Waimanalo and Honolulu on Oahu and Maunaloa on Molokai, federal officials said. Kahuku resident Lance Vendiola said she was washing the dishes in the kitchen when she felt the house shake a little and turned to asked her mother Shirley Hodges if she felt anything. Hodges was in a chair, watching television. "She said she felt the chair rock. ... The chair was going back and forth for a couple of seconds," Vendiola said.